Apart from human centric lighting, IoT smart lighting system and “space-as-a-service,” what are other trends of commercial lighting in 2019? Let’s move on to see what Osram suggested. How to efficiently manage the space usage is critical to companies. In the past, place planning has been based on calculations using industry-standard formulas, software that addressed some of an organization’s requirements, or even a manual process. This process could take a while and is less flexible. Nevertheless, data-driven space optimization applications have been ushered into the commercial real estate industry as a sought-after Smart building IoT application. More companies will leverage a workspace analytics SaaS (Software as a Service) business model to optimize their space. The application will be enabled by data from the networked lighting system. Osram has partnered with Rifiniti, who specialized in workplace analytics, to offer smart building IoT solutions to the commercial real estate industry for improving operational efficiencies and occupant comfort. Last but not the least; sustainability continues to be the focus for people, as well as for property owners. Osram indicated that investor momentum behind sustainable investments is growing driven by climate change, stringent building codes, and a strong interest from tenants in reducing the amount of energy used. LED lighting and control strategies play a significant role in ‘going green’. 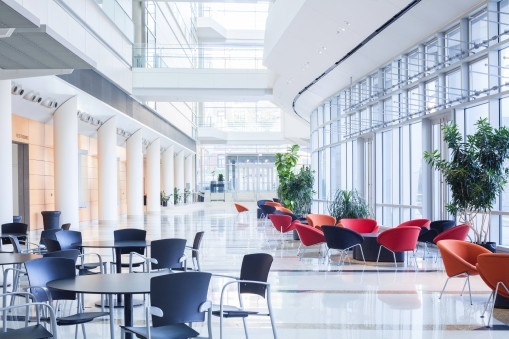 Using lighting control strategies, occupancy sensors, and reduced lighting plug load supports ‘green’ initiatives by reducing overall energy consumption. Control strategies such as daylight harvesting bring natural light to the building interior reducing the need for artificial lighting. Sensors in every luminaire collect occupancy data and feed it to Building Management Systems (BMS) which in turn regulate air conditioning depending on occupancy. Dimming lights during high peak periods in the electric grid reduces plug load and lowers utility costs while still providing effective light levels for occupants.